I specialize in tips, ferrules, removing nicks/dents, linen wraps, leather wraps and replacement shafts. Please see our Services page for more info. Feel free to browse around the site. There is a section devoted to cue repair services, with information on the different tips, ferrule, leather wraps, linen wraps, and a pricelist. There are links to local pool tournaments, leagues, pool on tv, websites streaming live matches, instructional information and general pool-related links. Enjoy! 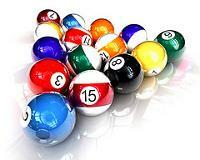 Are you having a Pool Tournament? If you are interested in having cue repairs done on-site, give me a call! Email or call to discuss further. To call us, please click the blue phone icon below and Google will connect you for free. © Copyright 2008 MiamiCuesandTips.com™ All Rights Reserved. Trademarks and images not proprietary to MiamiCuesandTips.com are used under license or with permission from their respective owners.